« How to predict success in CTO : The Japanese CTO score sheet ! How to recognise paradoxical or reversed split of second heart sound ? Normal sequence of S2 split is A2 followed by P2. This split is heard only in inspiration . The split is due to pulmonary low vascular impedance and is represented by the hang out interval (40-80ms) . Inspiration transmits the low intra-pleural pressure into pulmonary vasculature and split widens. In expiration the reverse happens and split narrows.Normal human ear does not recognize the normal expiratory split. 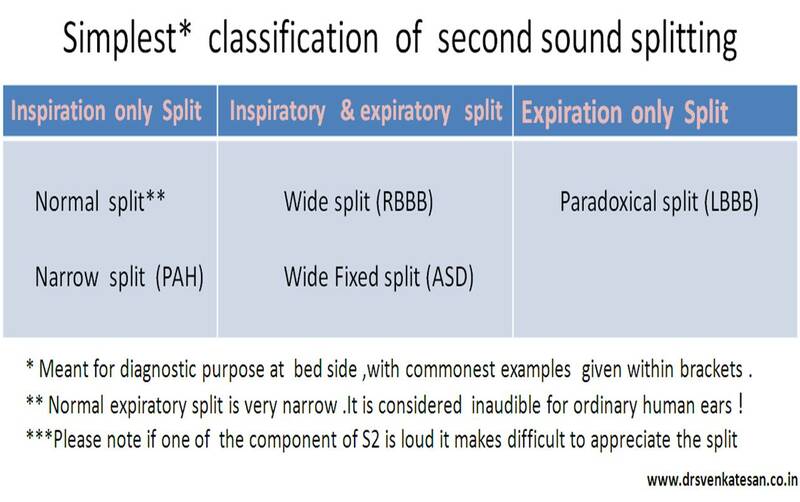 If the split S2 is well heard in expiration especially in sitting posture it is abnormal . What is paradoxical split of S 2? If split occurs and is well heard only in expiration and becomes single in inspiration , It is classical of paradoxical split. What is the paradox ? In physiological conditions S2 splitting occur during inspiration and become narrow or single during expiration. Conditions causing paradoxical split of S2 .